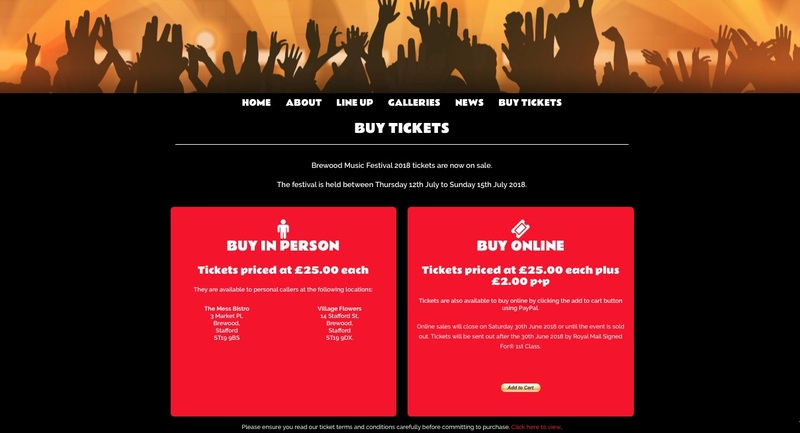 The latest batch of Brewood Music Festival tickets are now back on sale to personal callers and internet customers via the official festival website. Tickets priced at £25 are available to buy at The Mess Bistro, 3 Market Pl, Brewood, Stafford ST19 9BS and Village Flowers, 14 Stafford St, Brewood, Stafford ST19 9DX. Online tickets are priced at £25 each plus £2 p+p. Online sales will close on Saturday 30th June 2018 or until the event is sold out. Tickets will be sent out after the 30th June 2018 by Royal Mail Signed For® 1st Class. The event, which will be held at Brewood Middle School, brings together 70s legends The Osmonds and 80s hit makers Big Country. Rising local stars Sugarthief and acclaimed Shropshire blues outfit The Rainbreakers will also perform. The Saturday concert is the only ticketed event across the four days of music with ticket sales largely responsible for funding the entire not-for-profit community festival. The latest headliners add to an already impressive list of performers who have already appeared at Brewood Music Festival. These include Nick Heyward, Formerly of Bucks Fizz, Glenn Tilbrook, Toploader, The Manfreds, The Move, The Animals & Friends and Showaddywaddy amongst others. The festival begins on Thursday 12th July with a hugely anticipated performance by Birmingham Community Gospel Choir and runs through to Sunday 15th July. The Osmonds and Big Country perform on Saturday 14th July at Brewood Middle School Sports Field.